In ancient times, it was known as Kushavati (Jatakas). Kushinagar was a celebrated center of the Malla kingdom of ancient India. Later, it would be known as Kushinara, one of four holy sites for Buddhists. At this location, near the Hiranyavati River, Gautama Buddha attained Parinirvana (passed away), and was cremated. Many of the ruined stupas and viharas here date back to 3rd century BCE — 5th century CE when prosperity was at its peak. The Mauryan emperor Ashoka is known to have contributed to significant construction at this site. Prior to its rediscovery in the 19th century, there was a silence of more than half a millennium at Kasia. Due possibily to violent invasions, Kushinagar lost its vitality and eventually was neglected. The notable Buddha Temple, when rediscovered, was covered in a 40 foot high mound of bricks surrounded by a dense thorny forest. After E. Buchanan, an officer of the East India Company, arrived in Kasia in the course of his survey-work, H. H. Wilson, in 1854, made the suggestion that ancient Kushinagar and Kasia were the same. 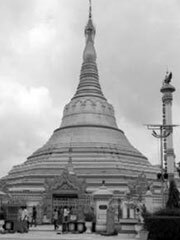 Work resumed around 1861-1862 when General Alexander Cunningham, an archaeological surveyor, would prove the site to be that of Gautama Buddha’s passing. A British officer named Mr. A.C.L. Carlleyle followed suit. Excavations began in the late 1800s and many important remnants of the main site such as the Matha Kuar and Ramabhar stupa were unveiled. Today, Kushinagar is a much-frequented pilgrimage site for foreign tourists and temples have been constructed by Chinese, Sri Lankan, Thai, and Japanese Buddhists alongside the ruins of monasteries and stupas. For Buddhists, this is one of four pilgrimage sites related to the life of Gautama Buddha, the other three being Lumbini, Bodh Gaya, and Sarnath.